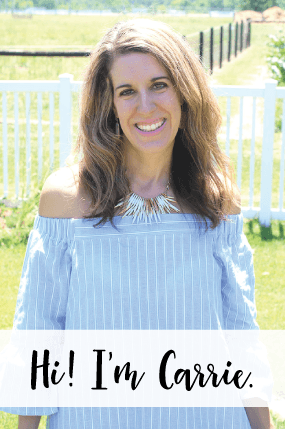 Well, we only have THREE more days until Christmas and today I will be sharing my last Christmas craft here on the blog. Every year I have the kids make an ornament for the tree and over the years we have done mostly snowmen ornaments, but we have done some with other themes. 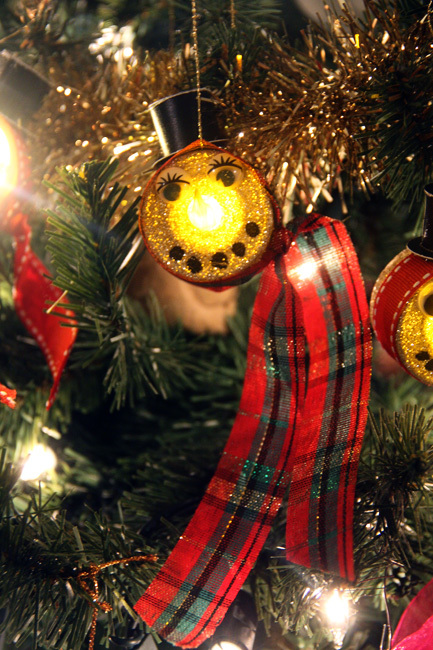 This year I saw an idea for a light up snowman ornaments on Pinterest, but I wanted to give it my own twist. 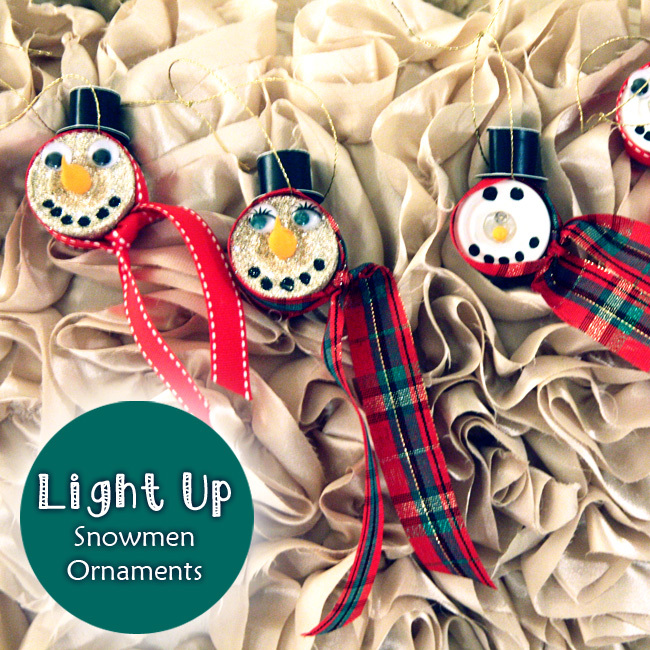 So, today I will be sharing these lovely and fun light up ornaments with you! They were easy enough for my 5 and 7 year old to work on and kids love anything that lights up! 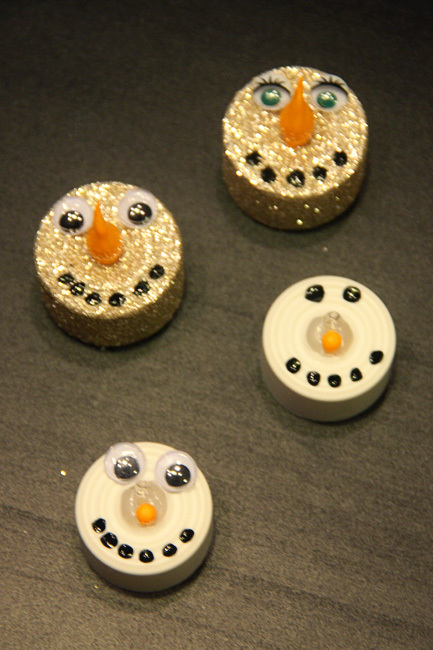 Plus, you could make a batch of them and give them out as small gifts to the grandparents! You don’t really need a lot of supplies for these and I had everything around the house, even the battery tea lights (leftover from Halloween). 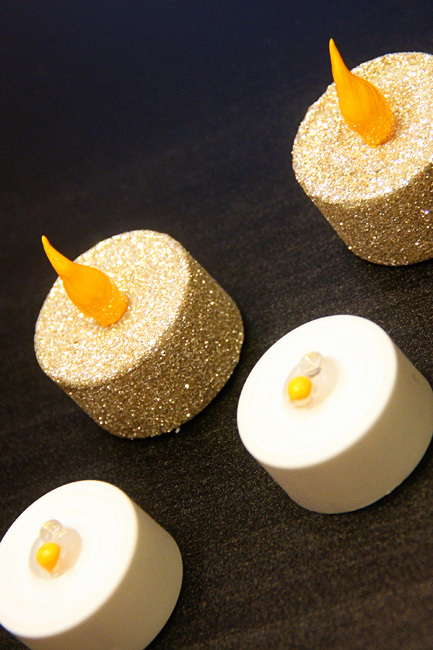 However, I did see some really cute glittery tea lights at Michaels and the light on them looks just like a little carrot nose that you’d find on a snowman. I know Target carries battery tea lights in their $1.00 spot quite often, too, so if you plan to make these next year you could keep an eye out for them. The first step is to paint the nose with some orange acrylic paint. 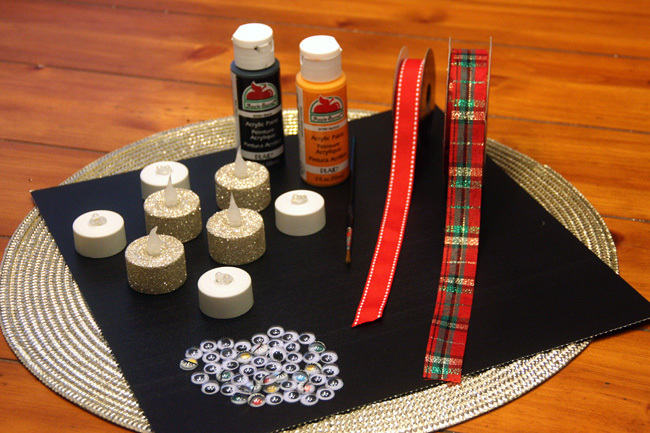 Then, you can hot glue on some googley eyes… or paint the eyes on with some black acrylic paint and they can be ‘button’ eyes. 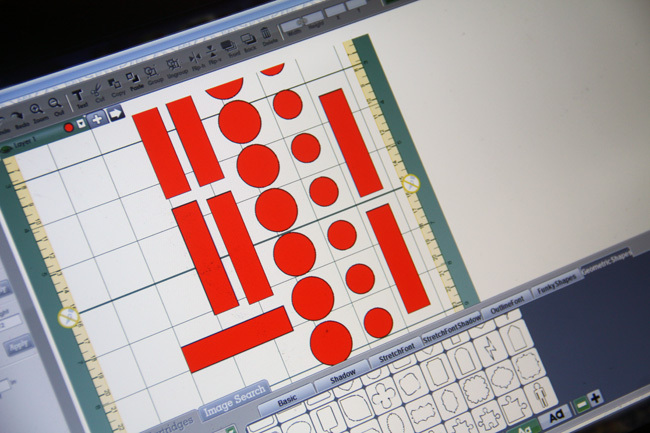 Don’t forget to make a mouth out of buttons, too! I used some leftover ribbon to make a scarf and I tied a double knot just to the side of the tea light. 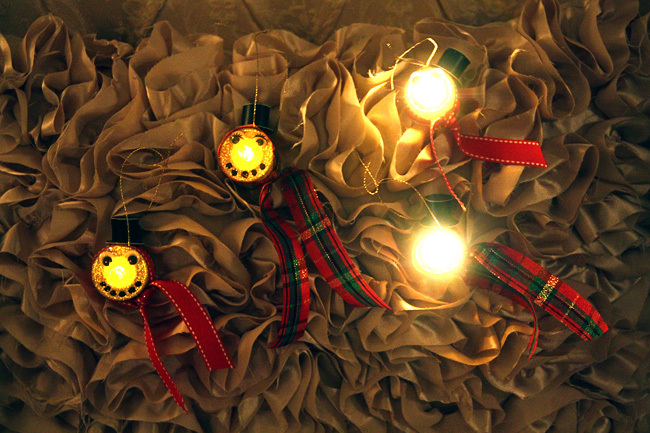 Then, tuck in some string around the top of the ‘scarf’ so that you have something to hang your ornament with. 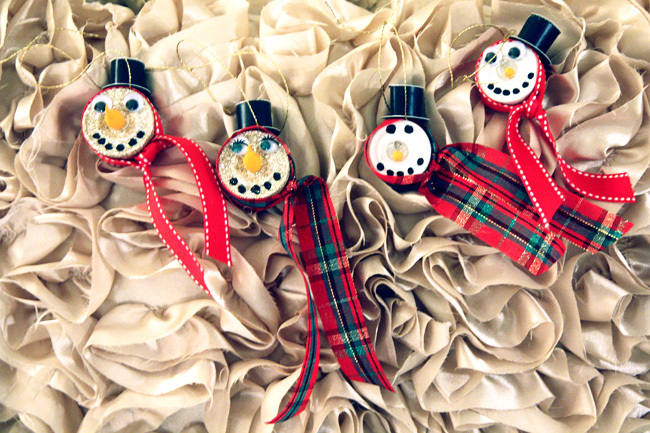 The last step I did was I hot glued a little top hat to each snowman. I used some old chalkboard cardstock I had, but you could use any kind of stiff black paper. To make the hats, I cheated and used my Cricut and cut out a larger circle for the bottom of the hat, a smaller circle for the top of the hat and then a long rectangle to go around the two circles. 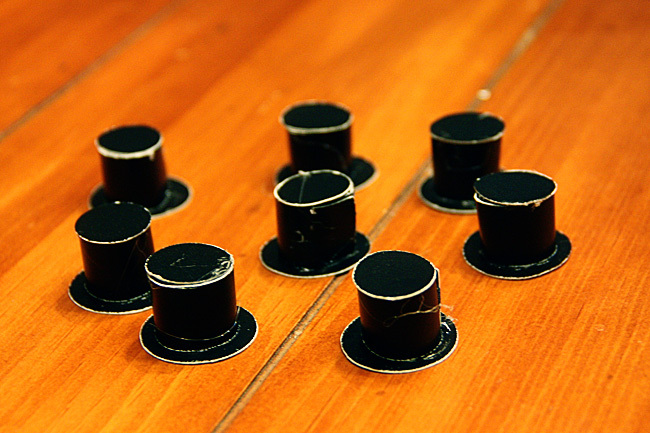 I hot glued these pieces together to make a top hat. 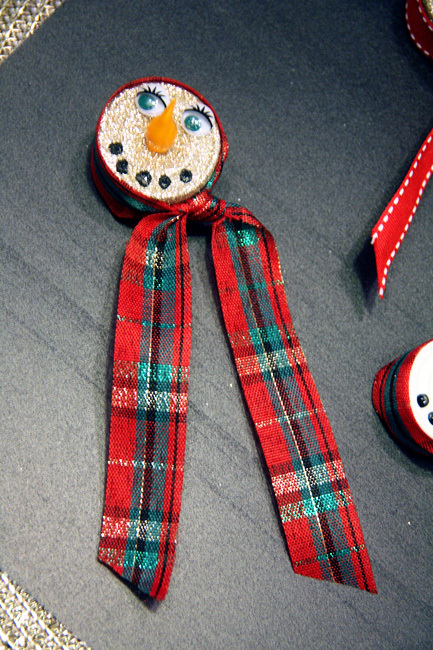 I made these up BEFORE the kids started on the craft, so that they were just extra ‘pieces’ to decorate their snowmen with. Here are the finished snowmen. Don’t you just love how each one is different? 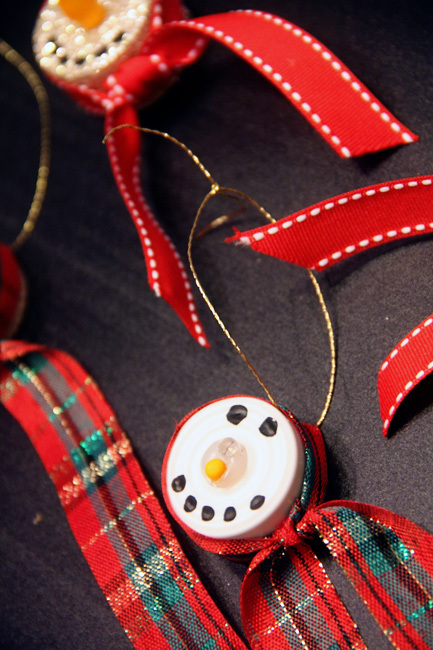 That is my favorite part about this ornament craft! And, of course I had to show you one lit up on the tree! I just love these!